Suwanee, GA (August 1, 2012) – OMIX-ADA, the world’s largest independent manufacturer and wholesaler of Jeep® parts and accessories, today announced that famed Jeep builder Dave Doetsch will publicly unveil his latest project Crush Recovery at the OMIX/Rugged Ridge Off-Road Success Center at the 2012 SEMA Show in Las Vegas. 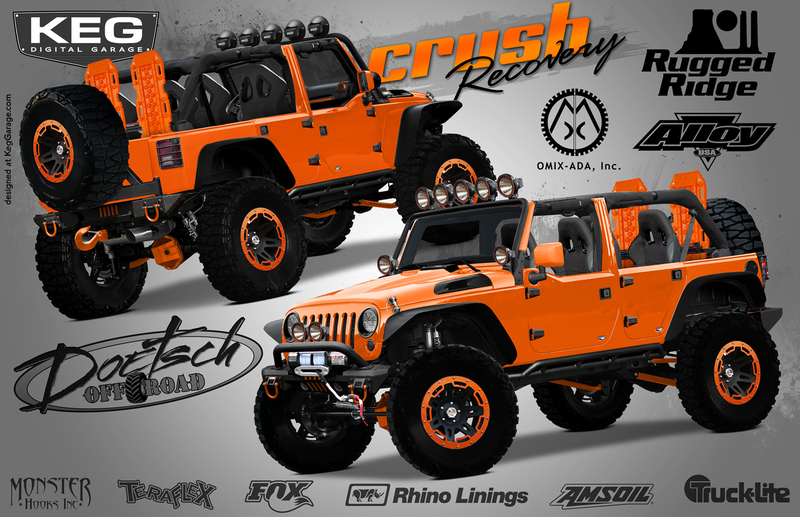 Based on a 2012 Jeep Wrangler Unlimited Rubicon 4×4, Crush Recovery is designed to be the ultimate off-road vehicle to recover 4x4s stuck in the toughest terrain. Doetsch outfitted the Jeep with more than 60 of the latest products from OMIX’s family of brands including, Alloy USA’s high-strength chromoly axle shafts and Rugged Ridge XHD Modular Aluminum Bumpers and new half doors for Jeep. Inspiration for the Doetsch’s Crush Recovery stems from both Jeep’s trusted reputation and unmatched versatility. Known as the most capable off-road vehicle on the market, the Jeep Wrangler Unlimited Rubicon 4×4 is the perfect choice for a go-anywhere, off-road recovery vehicle. Additionally, the new for 2012 Jeep color, Orange Crush, provides added utility and safety to Crush Recovery. The vibrant color stands out amongst the green and brown hues of the outdoors, making rescuers easily visible to those in need. Prior to debuting to members of the press and professionals within the off-road industry at the 2012 SEMA Show at the OMIX/Rugged Ridge Off-Road Success Center, Doetsch will also preview the Jeep to select attendees of the 2012 Airpark Jeep Jamboree in Scottsdale, Ariz. on October 13. A lifelong off-road enthusiast, Dave Doetsch transformed an early childhood interest of monster truck racing to a full-fledged professional business, designing and building some of the off-road industry’s hottest vehicles. Using his degree in mechanical engineering, Doetsch’s expertise has taken him from the rocks in Moab to the halls of The SEMA Show. In fact, in 2010, Doetsch built an appropriately named vehicle, JeepZilla, that was showcased during Jeep’s inaugural win of SEMA’s “Hottest 4×4 of the Year” award. In addition to Jeepzilla, other well-known builds of his include the 2011 Black Widow and 2009’s SIKJeep, one of the first ever Jeep Wrangler JKs to be fitted with 40-inch-tall tires, and a vehicle that helped establish the ever-popular tall tire trend. In addition to showcasing Doetsch’s latest creation, the Off-Road Success Center at SEMA will also display a range of vehicles illustrating the rich history of the industry, including vintage models provided by Jeep® Jamboree USA and OMIX. The Success Center will also be staffed by several third party experts within the industry, and leaders from OMIX who will offer twice daily educational seminars, one-on-one consultations, demonstrations and free print materials providing proven formulas for success within the Jeep and off-road market segments. For additional information and progress updates on Doetsch’s Crush Recovery vehicle, please visit the Rugged Ridge blog atruggedridgeoffroad.com/blog. For additional information on OMIX and Rugged Ridge please visit www.OMIX-ADA.com. Jeep® is a registered trademark of Chrysler Group LLC. OMIX-ADA is not affiliated with Chrysler.